It turns out everything really might be bigger in Texas. At least the recovery was. Before Rick Perry had trouble remembering three things, he liked to brag about the way the Longhorn State had bounced back from the Great Recession. He had a point. 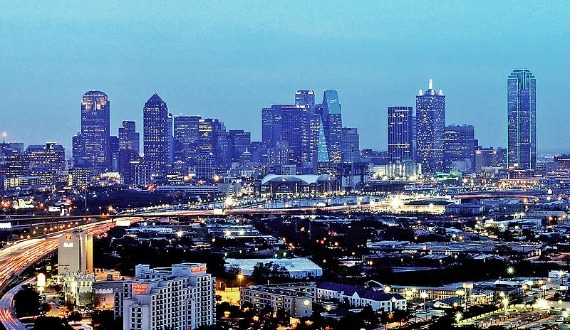 As my colleague Derek Thompson points out, Texas has dominated the recovery -- three of the top five fastest-growing metro areas are all in the state. Of course, those metro areas (McAllen, Austin, and San Antonio) are big but not that big. So what about its biggest cities? Well, they're dominating too. 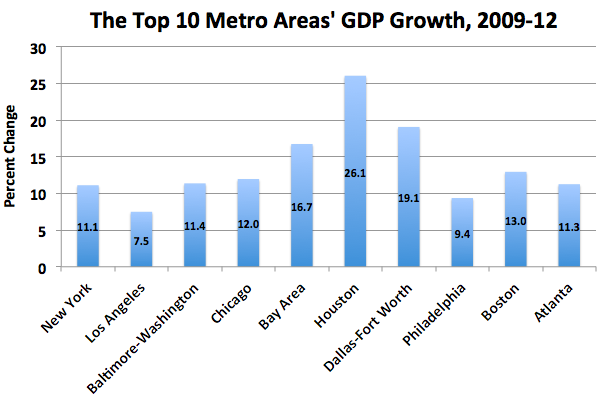 The chart below looks at how much the nation's top 10 biggest metro areas by GDP, listed biggest to smallest left to right, grew between 2009 and 2012. * And, as you can see, Houston and Dallas-Fort Worth are at the top of the class. Still, it'll be awhile before Texas is ready to mess with New York. 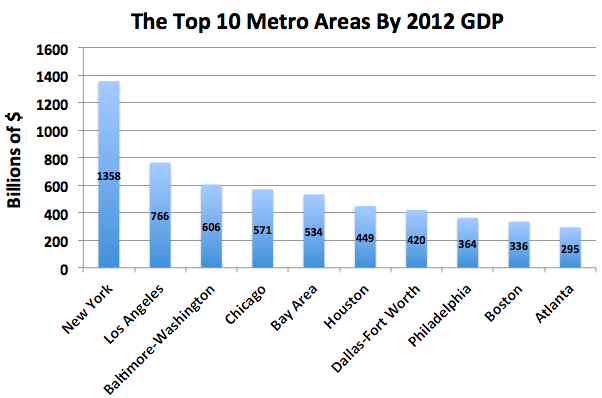 Despite their gangbusters growth, Houston and Dallas-Fort Worth (along with every other city) are far, far behind New York GDP-wise. In fact, the New York metro area has almost twice as big an economy as Los Angeles, the next-biggest one. The Sun Belt's formula of cheap land, warm climates, and, in Texas' case, oil have boosted their populations and GDP. But it's still Wall Street's world, and the 1 percent's economy. Nobody is dethroning New York. * I combined the Baltimore and Washington metro areas, as well as the San Francisco and San Jose metro areas in the numbers above. I also combined metro areas that fell outside of the top 10 to see if that pushed them into the top 10. It didn't.